The OSIRIS-REx spacecraft launched from Earth on September 8, 2016, headed for the asteroid Bennu. If all goes according to plan, the mission will return a sample of that body to Earth. The first close-up photos of the asteroid have now been released, showing some surprises that could affect the future of the mission, as well as the asteroid itself. On March 19, researchers released a series of new papers on findings from Bennu, exploring a wealth of new information about this distant body. Some of these findings reveal that bringing a sample of the asteroid to Earth could be more difficult than planned. Still, mission planners feel they will be able to complete their mission. “Despite these newly found challenges, our team is confident that we will meet the science objectives. The OSIRIS-REx team designed the mission with flexibility and capabilities to deal with the unknown, and we are prepared to answer the challenges Bennu has given us,” said Dante Lauretta, OSIRIS-REx principal investigator and professor of planetary science at the University of Arizona’s Lunar and Planetary Laboratory. The intrepid spacecraft arrived at its destination on December 3, 2018, and has, so far, completed a few dozen orbits of Bennu, as it orbits at a distance of around 1.6 kilometers (one mile) from the asteroid. Bennu, roughly the height of the Empire State Building, is found to have a mass of around 73 billion kilograms, meaning it would weigh more than 160 billion pounds on the surface of the Earth. An overview of the OSIRIS-REx mission in a video from the University of Colorado Boulder. When mission engineers planned the OSIRIS-REx encounter with Bennu, they believed the asteroid contained large flat areas stretching over 50 meters (165 feet) across, covered in pebbles just two to three centimeters (one inch) in diameter. That analysis, it now appears, was incomplete. The Origins, Spectral Interpretation, Resource Identification, Security-Regolith Explorer (OSIRIS-REx) reveals a surface where smooth areas are limited in size to regions just five to 20 meters (15 to 65 feet) from side to side. This is much smaller than the area expected by planners for the touch-and-go phase of the mission to collect sample material from the surface. 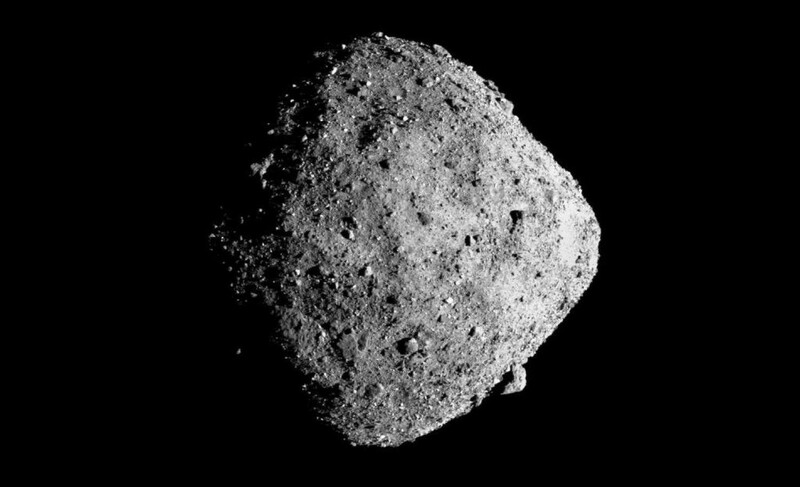 Cameras aboard OSIRIS-REx show more than 200 boulders on the surface of the asteroid larger than 10 meters (33 feet) in diameter, as well as countless others one meter (three feet) in diameter or larger. The greatest of these boulders stretches a whopping 59 meters (almost 190 feet) from one side to the other. Bennu is one of the darkest objects in the Solar System, reflecting, on average, just four percent of the light which strikes its surface. However, the reflectivity, or albedo, of the asteroid varies greatly from one area to another. This unexpected finding could make it more difficult than planned for the spacecraft to land on the asteroid, as the approach and landing is dependent on a lidar system, using pulsed laser beams to measure the distance to the asteroid during approach. The surface of Bennu, found to be between 100 million and one billion years old, is surprisingly more dynamic than expected. OSIRIS-REx found high-standing ridges running from the north to south pole of the asteroid, large craters infilled with material, and a lack of small craters on the body. 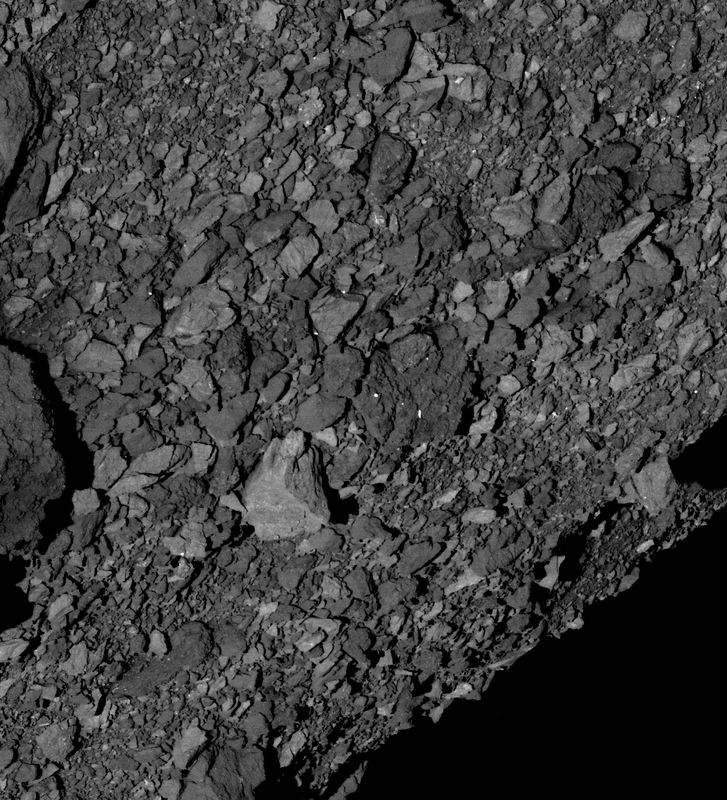 Bennu shows signs of being composed of boulders, rather than a single rock. This structure is similar to what new research suggests could be the end result of an asteroid which has experienced significant impacts. Particle plumes were seen emanating from the surface of Bennu in another unexpected finding from this ongoing mission. 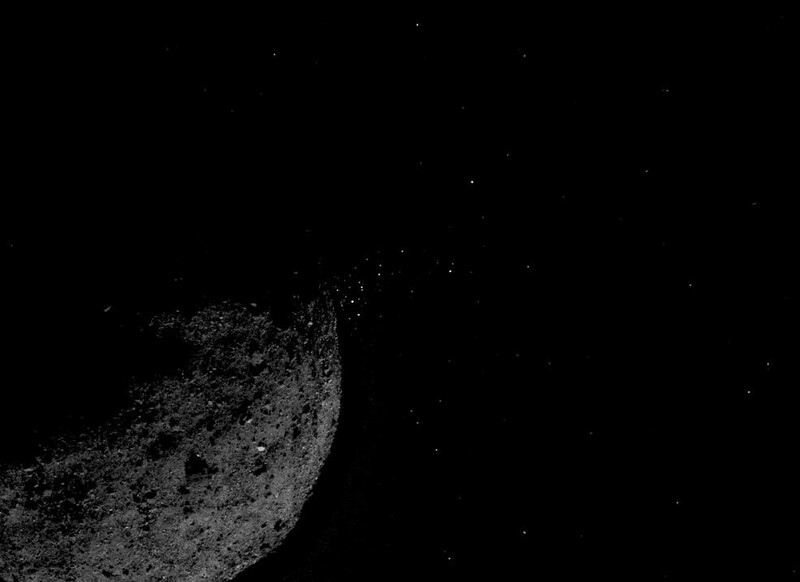 While most of the particles ejected from these plumes escaped the minuscule gravitational pull of Bennu, some orbited the asteroid, before crashing back down to its surface. “The discovery of plumes is one of the biggest surprises of my scientific career. And the rugged terrain went against all of our predictions. Bennu is already surprising us, and our exciting journey there is just getting started,” Lauretta stated. Bennu is spinning around its axis once every four hours, and OSIRIS-REx found this rotational rate is increasing over time, at a rate of around one second every hundred years. This acceleration may seem slight, but this increase in rotational velocity, driven by uneven heating of the surface from the Sun, could have radically changed the surface of the asteroid over the last million years. “When you spin this guy up, you create a competition between the gravity that’s holding you down and the centrifugal acceleration, which is trying to throw you off,” said Daniel Scheeres, leader of the mission’s radio science team. To measure the gravitational makeup of Bennu, researchers looked at how the asteroid influences the path taken by OSIRIS-REx as it orbits. 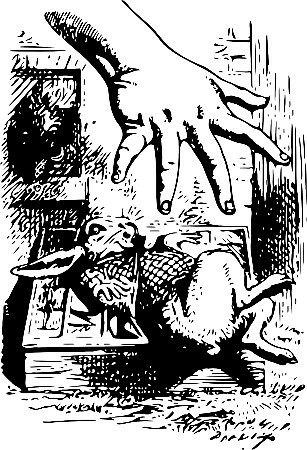 What they found came as a surprise, straight out of Alice in Wonderland. Bennu possesses a gravitational feature known as a rotational Roche lobe — a quality unexpected in an asteroid. If an astronaut were walking along the equator of Bennu and slipped, they would fall down, in a wholly unremarkable fashion. However, were an unfortunate space walker to slip and fall outside this lobe, they would be accelerated toward the equator of Bennu, and likely shot into space. This quality could play an important role in the eventual destruction of Bennu. As the rotation of Bennu increases, the Roche lobe grows thinner, making it harder for material to hold together. In short, the increasing rotational rate of Bennu may result in the destruction of the asteroid. “As that Roche lobe narrows further and further around the equator, it becomes easier and easier for this asteroid to lose material. So far, that material has been trapped by gravity, but at some point, if the asteroid keeps spinning faster, then you fall off the cliff,” Scheeres said. Water may have also played an important role in the evolution of Bennu, as OSIRIS-REx found evidence of hydrated materials throughout the surface of the asteroid. Researchers expect that water-bearing clays may be holding on to hydroxyls — molecules containing hydrogen and oxygen, which can be a precursor to water. Bennu itself is far too small to hold on to liquid water, but this finding suggests the parent body, from which Bennu broke, may have once once been home to water. 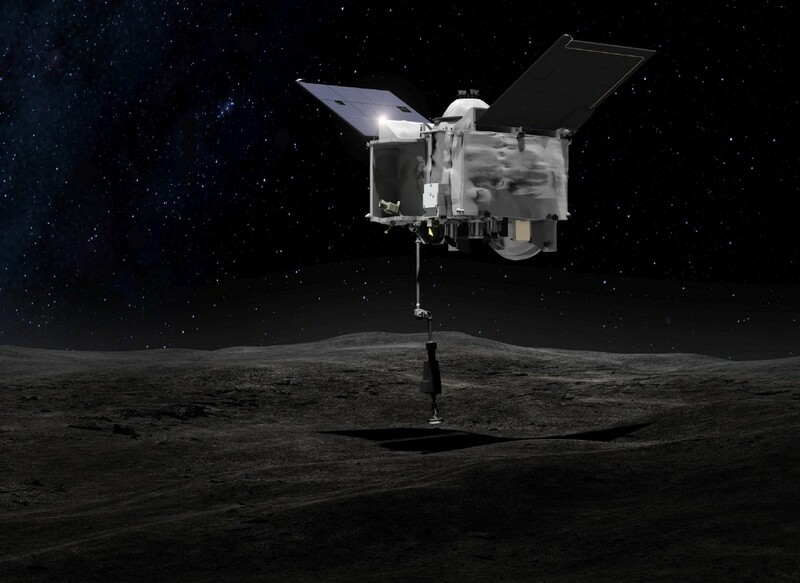 In 2020, OSIRIS-REx will be guided within just a few feet of the surface of Bennu, and a robotic arm will extend the TAGSAM (Touch-and-Go-Sample-Acquisition-Mechanism) instrument onto the surface. During five seconds of contact, nitrogen gas will blow onto the surface, allowing the device to collect sample material. The sample will be placed in a sample return capsule, and the spacecraft will withdraw from the asteroid. In March 2021, OSIRIS-REx will head back home, arriving at Earth in 2023. By studying this ancient body, astronomers hope to learn more about the early Solar System. After just a few months at Bennu, the spacecraft has already taught us this asteroid is full of mysteries.